Personal Drawer Safes With Top Openings Provide Secure Storage For Applications Including Residential, Commercial, Storage And More. 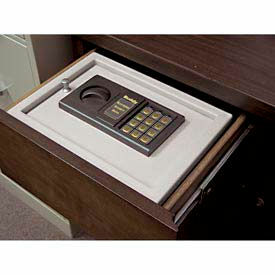 Personal drawer safes with top openings are made of steel for lasting durability and dependability. Electronic locks prevent unauthorized access to money, jewelry, weapons, important documents and more. Units are shelf or drawer mounted for convenient or obscure access versatility. Optional mounting hardware available. Not recommended for CD, DVD or electronic device storage. Lock types are Biometric Fingerprint Lock and Keyed Lock, Electronic Combination Lock and Electronic Keypad Lock and Keyed Lock. Cubic feet capacities are 0.13, 0.18 and 0.23. Available colors are Black and Platinum. Dimensions vary per model. 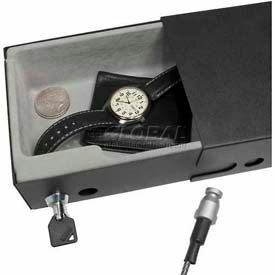 Drawer Style Compact Safes Protect And Secure Valuable Documents, Jewelry, Cash And More. Drawer Style Compact Safes are made of steel to provide long lasting durability. Long self-locking security cable can be tethered to a fixed object for added security. Cable hole allows device charging while safely locked inside safe. Available styles are Keyed Lock and Biometric Fingerprint Lock. 2 back-up keys included. All hardware included. Dimensions vary per style.